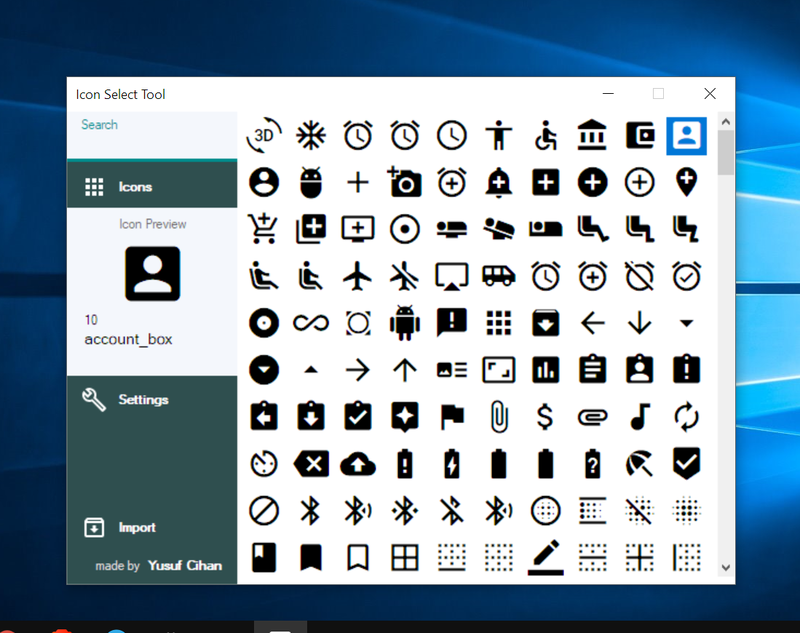 If you have difficulties for searching icons to in your project, then this tool for you. I’ve made a Windows app to choose Material Icon in your projects. So you will be able to find the icon you are looking for in your project. Import your own icons with your own icon font. Sorting A - Z or Z - A. This tool is NOT ONLY for Material Icons. It can be any font which includes icons. A device with a Windows operating system. Most computers come with built-in .NET Framework, so install only if this tool is not working in your device. You need to install Material Icons font for use Material Icons in this tool. This tool may have few features or bugs, so don’t forget to give feedback to improve this tool. Is this MDC? If so I know how and the idea of where you got it from. No, I just wanted to make like Material. I used empty labels with background color. idea of where you got it from. I opened it and it came to me , I did nothing but unpack, I want to use material icons. Didn’t you read to install the Material Design Icons on your computer, download it then open the TTF file and press Install then wait. 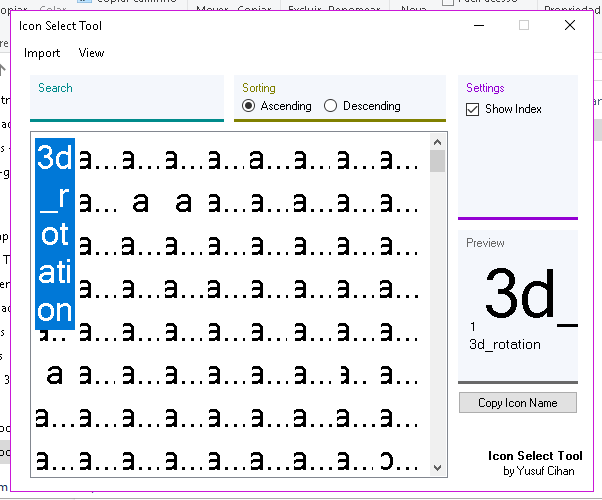 Yes, @Soft_Darsh you need to install font before using this tool. I will make a wizard or something to make easier doing these steps. Umm, no. I won’t stop doing that. Because Textfields is a rare component which most apps don’t have. And I’m using in everywhere Textfields instead of Textbox. More clear and more useful. I added Settings properties for saving settings even you close app. Importing icons is easier than ever. Just select what you need. This tool will help you to use custom icons and/or custom icon fonts for this tool. Just click empty area of panel. As you can see, I removed “Copy Icon Name” button. 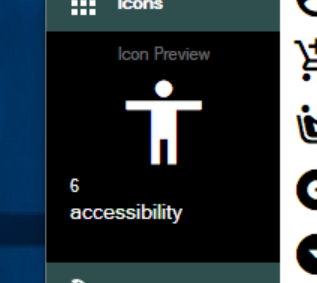 You need to click icon (from Icon Preview section) to copy icon’s name. I might be adding this for my Material Outlined Icons on an upcoming site of my own That actually deals with mySQL Database and real PHP, I’m starting to learn and I actually find it another easy language along with another thing itll be used for, not just for the Icons… Right now, I’ve made an account registration and signin system that works with email verification, this was based off a tutorial at first. I used very minimum to get to where I am today, I have an Admin Panel for only Admins, yes it detects things now, and I am implementing updating User Data from there. If youre not an Admin, it redirects you to the dashboard. Special! How do we know its not? You can scan with your antivirus engine. As you can see in report, any popular AV engines detected this software as virus. Sometimes, some engines makes false decisions, also I don’t think I can make a virus in Visual Studio. If you want to go deeper, there is a option in VirusTotal which shows assets / source of this software. So you can see what files included with this tool.